News | Kevin O'Neill offers LEAGUE original art for sale! 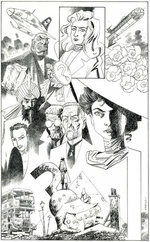 For the first time, British comics legend and League of Extraordinary Gentlemen co-creator Kevin O'Neill is making available almost 90 pages of original artwork from recent League graphic novels! The selling exhibitions -- one in Brussels and one in Paris -- include the front covers and some of the greatest interior pages from The Black Dossier, Century: 1910, and Century: 1969. Paul will be present to open the exhibitions later this month: December 15th at the Galerie Champaka in Brussels, followed by December 16th at Galerie 9eme Art in Paris! 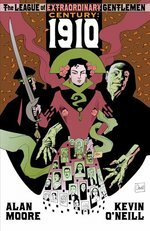 For more details, check out exhibition consultant Paul Gravett's announcement here, or the Galerie Champaka site where the pages will be viewable and purchasable. As Champaka's official statement notes, "[O'Neill's] pages evoke the intense detail and crosshatching of nineteenth-century illustration and combine a lavish sensuality with many witty references to the literature and artistic imagination of each book’s respective era. His detailed artwork reveals new delights with every viewing. O’Neill is truly in a ‘league’ of his own."